German States stamps for the Duchy of Braunschweig were issued from 1852 to 1865. Note: For clarity's sake, and to avoid keyword confusion with numerous other entities in today's World that are called "Brunswick", I shall use the German name, "Braunschweig", in the content of this page. Prior to the Napoleonic Wars, Braunschweig had been part of the Kingdom of Hannover. The Congress of Vienna, in 1815, declared the lands under the control of Braunschweig an independent state under the rule of the House of Wolfenbütel. 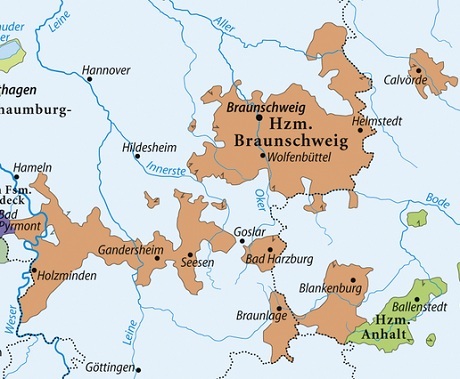 The Duchy of Braunschweig was never a contiguous state but a collection of territories under the control of various members of the House of Wolfenbütel. The "state" of Braunschweig is shown above, as brown colored areas on the map. The Duchy eventually joined the North German Confederation, and in 1871, it became part of the German Empire. The three German States Stamps for Braunschweig shown above were issued on January 1, 1852. These first stamps are typographed on unwatermarked white paper, and they are imperforate. The central design features the Arms of Braunschweig, consisting of a crown above a leaping Saxon horse. 01 Sgr. (1852 - Mi. #1, Sc. #1) - Pale Carmine (Sc. - Rose). 02 Sgr. (1852 - Mi. #2, Sc. #2) - Prussian Blue (Sc. - Blue). 03 Sgr. (1852 - Mi. #3, Sc. #3) - Pale Orange Red (Sc. - Vermilion). 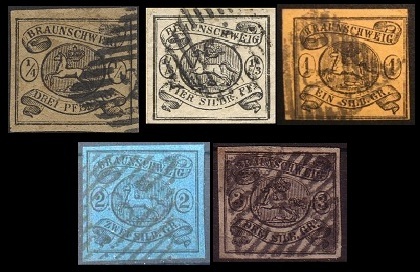 The five new German states stamps of Braunschweig shown above were issued between 1853 and 1856. These new stamps are printed on colored papers with a posthorn watermark within a square, and they are all imperforate. 1/4 Ggr. (1856 - Mi. #4, Sc. #4) - Black on Yellowish Brown. 1/3 Sgr. (1856 - Mi. #5, Sc. #5) - Black on Grayish White. 01 Sgr. (1853 - Mi. #6, Sc. #8) - Black on Yellow (Shades). 02 Sgr. (1853 - Mi. #7, Sc. #9) - Black on Blue (Shades). 03 Sgr. (1853 - Mi. #8, Sc. #10) - Black on Rose (Shades). The rather odd looking Braunschweig stamp shown above (Mi. #9, Sc. #12) was issued in 1857. This new stamp is printed in black on brownish paper with a posthorn watermark within a square. This was actually 12 Pfennig denomination stamp, subdivided into four individual 1/4 Ggr. denomination stamps. With this arrangement, it was kind of like buying a mini-sheet of 1/4 Ggr. stamps that could be used individually or in combinations, as needed. A similar stamp was printed in buff on white paper (Mi. #I, Sc. N/L), but it was never issued. Today, examples are common, and they are very inexpensive. The three new German states stamps of Braunschweig shown above were issued between 1861 and 1863. These new stamps are printed on colored papers with a posthorn watermark within a square, and they are all imperforate. 1/2 Gr. (1863 - Mi. #10A, Sc. #6) - Black on Grayish Green. 01 Sgr. (1861 - Mi. #11A, Sc. #7) - Black on Yellow. 03 Sgr. (1862 - Mi. #12A, Sc. #11) - Rose on White. During the Summer of 1864, experimentation began in rouletting sheets of stamps to facilitate their separation. Previous imperforate leaping Saxon horse denominations were used for the experimental rouletting trials. 1/2 Gr. (1864 - Mi. #10B, Sc. #14) - Black on Grayish Green. 01 Sgr. (1864 - Mi. #11B, Sc. #15) - Black on Yellow. 01 Sgr. (1864 - Mi. #11C, Sc. #15) - Black on Yellow. 03 Sgr. (1864 - Mi. #12C, Sc. #18) - Rose on White. 01 Sgr. (1864 - Mi. #11D, Sc. #20) - Black on Yellow. 03 Sgr. (1864 - Mi. #12D, Sc. #22) - Rose on White. 1/3 Sgr. (1864 - Mi. #13A, Sc. #13) - Black on Grayish White. 01 Sgr. (1864 - Mi. #14A, Sc. #15) - Black on Yellow. 02 Sgr. (1864 - Mi. #15A, Sc. #17) - Black on Blue. 03 Sgr. (1864 - Mi. #16A, Sc. #18) - Black on Rose. 01 Sgr. (1864 - Mi. #14B, Sc. #20) - Black on Yellow. Many of these rouletted stamps are rare and extremely expensive. This is especially true of the rouletted 1861 to 1863 issues. Caution should be exercised, when buying any of these rouletted stamps, especially any that have not been properly certified or authenticated. The four new German States stamps for Braunschweig shown above were issued on October 1, 1865. These stamps are printed on unwatermarked paper, and they are rouletted 16. 1/3 Gr. (1865 - Mi. #17, Sc. #23) - Black. 01 Gr. (1865 - Mi. #18, Sc. #24) - Carmine Rose. 02 Gr. (1865 - Mi. #19, Sc. #25) - Ultramarine to Blue. 03 Gr. (1865 - Mi. #20, Sc. #26) - Orange Brown to Yellowish Brown. The designs feature the Arms of Braunschweig, consisting of an oval with a crown and leaping Saxon horse, and they are all denominated in Groschen. Due to their brief period of usage, authentic used examples of these stamps are very scarce. At the beginning of 1868, the German States stamps of Braunschweig were replaced by those of the North German Confederation.